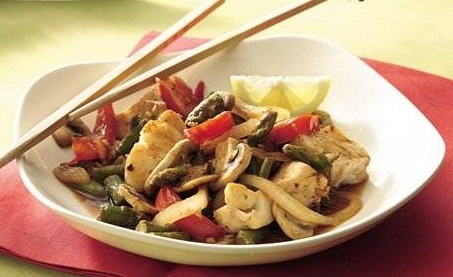 This Halibut Stir Fry Recipe is easy, but very tasty. 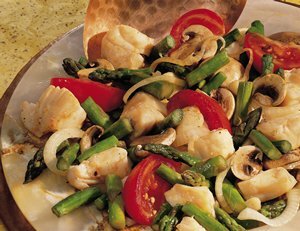 Halibut lends itself to just about any kind of recipe and cooking technique including stir-frying, baking, broiling, pan-frying, deep-frying, poaching or barbecuing. You know your fish is cooked perfectly when it just begins to flake with a fork. Stir-frying? What is it, Donna? Stir-frying is actually a Chinese cooking method in which ingredients are fried in a small amount of very hot oil while being stirred (in a “wok”). It was the early 20th century in China and the well-off throughout the world that stir-frying became an important cooking technique. Boiling and steaming remained the main cooking techniques until families were able to afford the oil and fuel it took to do a proper job. Since halibut has a mild flavor, you can pair it with many other flavors, herbs, or spices to create many wonderful meals. You can usually find fresh halibut in the supermarket from April through November. Halibut freezes exceptionally well and frozen halibut is available year-round. Note: If you are counting carbs, this is one of many recipes on the website that will work for you. Assuming four servings, each serving only has about 8 grams of carbohydrates. As a option, try adding 2 tablespoons of tamari and/or lemon juice at the end of the cooking process. Garnish with a lemon wedge and serve with rice or over rice or pasta and a salad. 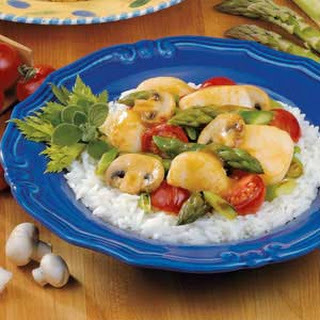 Enjoy your Halibut Stir Fry seafood recipe and the company of those you share it with.